Shingo Yamashita was one of the pioneers of the digital animation movement in anime. He made a name for himself drawing stunning, emotionally loaded sequences, and then moved on to become a creative leader as he experimented with directorial duties and the possibilities enabled by new toolsets. Despite being quite busy, he kindly lent us his time to talk about the changing landscape of this industry and its professionals, the world of digital animation, his evolving creative philosophy, and even his future projects that he’s looking to fund. Enjoy this exclusive interview! ─ Thank you very much for taking the time for an interview. I know you must be busy. I have a deadline coming up, but this makes for a nice change of pace! 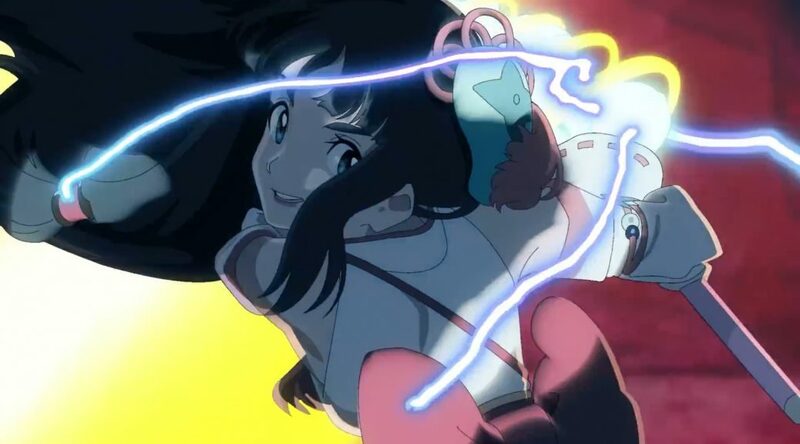 ─ The anime industry is seeing an inflow of young digital animators that don’t come from a traditional pen-and-paper background. As one of the members of the first wave of webgen animators, how do you see their work? Does it feel different from what you used to see? It feels as though they learn faster and are getting better than us. If the peak when I was doing key animation is a 5, then they’re putting out work at a 6 or 7 from the very start. It’s hard to say how they’ll grow from there, but I suspect that they might grow tired of animating faster than I have. Yamashita’s animation at its most spectacular, which inspired many of the younger generations who followed up that digital animation path. 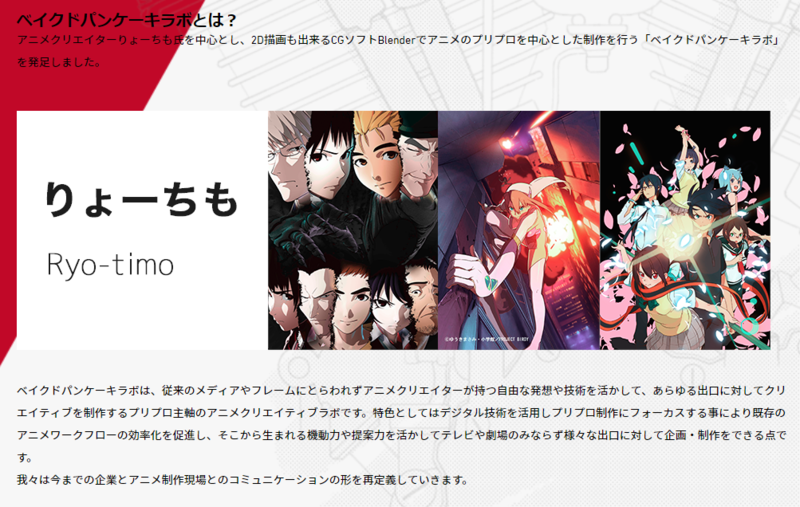 ─ It seems like those early webgen animators are moving away from 2D animation, with Kenichi Kutsuna co-directing a 3D show, ryo-timo doing 3D work and developing digital animation tools, and you doing various work outside of TV anime. Is there a reason for this? Was this industry no longer attractive for you all? I can’t speak for the other two, but I’m following the path that lets me do what I want to do deep down. 2D animation is but one of many means of expression, so to continue to work with just that takes the spirit of a true craftsman. Maybe that’s what the three of us are lacking (laughs). As for me, right now I want to make anime starting from the writing stages. When you have a manga, light novel, or video game adaptation, you’re not dealing with material meant to be portrayed in a medium like anime from the get-go (although I guess that’s obvious). As time passes, I feel a growing need to make an anime based on a scenario and a setting specifically written for it, like Hayao Miyazaki’s works, or Evangelion, or Madoka Magica. ─ As a fan of Birdy Decode and Yozakura Quartet I have to ask: is there a chance you’ll work with ryo-timo again? If I ever strike it rich, I’ll definitely reach out with an offer… Although from the occasional conversation with him, it looks like he’ll be busy for a while with his work creating a workplace environment for digital animation. Baked Pancake Lab, one of ryo-timo’s new initiatives to develop digital workflows under the Twin-Engine umbrella. ─ One of your main occupations as of late has been directing 2D promotional videos and openings for video games. Are the working conditions much better compared to TV anime work? You can find work that has both low and high rates, but as a whole, it’s so much better than TV anime that there’s really no comparison. The catch is that as you join a company and financials get involved, more and more of the budget ends up going to the buffer for the production itself. So I can understand why the anime industry is “cheap”. In the end, if you don’t have a business plan that can create enough value to yield a profit, nothing will come out of bemoaning bad conditions. There’s not much you can do in lieu of complaining, short of starting your own company. I really admire what people like rapparu [independent animator gone self-sufficient as much as possible] are doing. ─ From TVPaint to CLIP STUDIO PAINT and ToonBoom, there are now many popular digital animation suites out there. Is there one you use regularly? You were a known proponent of Flash. I’m still using Flash. Nowadays, I rarely do key animation myself, so I don’t feel limited at all by it. It’s perfectly suited to drawing storyboards. The second opening for Twin Star Exorcists is one of Yamashita’s finest pieces of action storyboarding, and also some of his most emotive direction. ─ On the topic of working digitally: Toei’s digital workflow is advanced, Tatsunoko is always at the forefront, and Colorido seems like a promising new player. Are there any other anime studios that have caught your eye? For what it’s worth, I’m working at Colorido now… (laughs) Personally, Ufotable would be the clear winner by a mile when it comes to making short-form footage. Also, the duo that is (Shun) Enokido-san and (Takahito) Sakazume-san… Wonderful, minimal products. Quite frankly, the strength of working digitally is in being able to better apply photography effects to the animation, which is why digital hand-drawn animation by itself won’t lead to appreciable changes to the final work. It’s by using post-processing routines to achieve detail not possible at a hand-drawn level that we end up with low-labor, high-quality animation. Well, as long as it doesn’t end up with even fewer resources being allocated… (laughs) In that sense, hand-drawn animation itself is the section that receives the least benefits from the digital shift. I drew the storyboards for the Beatless ED, and I ended up just doing a direction check on the digital painting footage (so-called TracePaint data check), without even worrying about the post-processing. Even then, you end up with quite passable-looking footage, so being able to fiddle with that directly felt like one of the strengths of digital animation. In the end, there isn’t much where it saves time in the department of 2D animation direction though. The perfect marriage of Yamashita’s animation with his own composite effects achieve a magical effect that’s more than the sum of its parts. ─ When thinking about who shaped your animation style, Norio Matsumoto immediately comes to mind. But what are the influences that have stuck with you in general? For manga, it’d be Yoshihiro Togashi and Nobuyuki Fukumoto. As for video games, Braid, Last Guardian, Undertale, and Doki Doki Literature Club. For visual novels, Cross Channel; Shoin, Aruiwa Ushinawareta Yume no Monogatari; and Subarashiki Hibi. When it comes to anime creators, Hayao Miyazaki, Hideaki Anno, and Mamoru Hosoda. As for animators, it’d end up being Osamu Tanabe, Mitsuo Iso, and Norio Matsumoto after all. No matter what, it feels like the works I make end up taking from these in the end. ─ Many fans know you as an action animator, but what left an impression on me was how you incorporated those photography effects into the animation to offer something more “complete”, bringing out a scene’s mood or a character’s emotions — be it warmth or ugly feelings. Is that your goal as a creator? I said before that I want to write a scenario, but ultimately, I’ll be satisfied when I create the best scene, atmosphere, dialogue, characters. There are all of these scenes in my head that surpass any anime or manga out there, and I’m continuously studying and practicing to bring them to life. I want to be moved. To cry at my own work. It feels like that’s all I’ve thought about since I was a teenager. While tied to a TV series, Yamashita’s ending sequence for From the New World stands as a beautiful short film of its own. ─ Has going from an animator to episode director changed how you approach your work? I stopped harboring negative feelings about having key animation corrected. As an animator, I saw it as a defeat when my drawings were corrected, and became discouraged when I saw someone who was better at animating than I was. But now, it’s more like if there happens to be something missing from my work, I can ask the person who can fill in that gap to do so. So even when I do key animation, I do what I can, and leave the rest to someone who can do it better. Corrections that ruin the original animator’s ideas just increase the workload and yield diminishing returns, but there’s no limit to the improvements that come from corrections that make use of the original plan while adding touch-ups. I try to keep in mind the latter when I make corrections, which requires a level of tolerance and understanding of others. Most importantly, you need to overcome the feeling of wanting to be the only contributor that stems from a sense of inadequacy. I still can’t draw polished, final-quality pictures (without taking a really long time at least), but as an episode director that hasn’t really been a problem. There are those who worry about lacking in aspects because they work to support the section they focus on. My area of expertise is gathering those kinds of people and bringing out the parts they excel at to create something. I believe it’s because I myself am quite lacking in places. The recently released opening for Blade Smash is an excellent showcase of Yamashita’s ability to bring out the best out of the artists he works with, allegedly to make up for inabilities of his own. ─ Before we end, can you tell us anything about your upcoming projects? I’m drawing a manga for an original project as I continue to work on commercials, OPs, and PVs. It’s a story about parent-child and husband-wife quarrels. There are magicians. It starts off feeling like a slice-of-life (maybe?) but there are magic battles in the second half (laughs). I hope to show a short pilot film in the next year or so, so look out for that. I’m looking for sponsors! Worst case scenario, I’ll pay for it myself (laughs). ─ Once again, thank you for taking the time for this interview today. Fans all around the world love your work! Awesome interview. Yama has long been a hero of mine, and a major factor in me falling in love with animation. I didn’t know he was at Colorido! Any idea what he’s working on over there? And did he do anything on Penguin Highway? He’s not part of the studio per se but he contributed to Fastening Days 3 for example. It’s his kind of environment and he’s acquainted with a bunch of the staff so it makes sense for him to be stationed there now and then. Dumb question, but what show is the source for the title image? Its seems really familiar but I couldn’t figure it out with a bunch of googling. It’s the last video in tagged in the post. Great friggin interview Kevin. I guess you translated his answers? If not I must say what a flowery vocabulary this person has in English. Hot damn I hadn’t seen that Blade Smash opening. As a 3D artist, it fascinates me to see the visuals these visioners are working on and how 3D tools take a role in them, specially stuff like what’s seen in Ryotimo’s twitter. Very good questions. Sad to hear “there really is no comparison” between TV anime work conditions and other types of media. Apparently, Blade Smash is the new title for a mobile game called Ninjaka Spirits. Yep, that’s it. Can’t exactly live up to his cool opening but that’s not a new problem for the things he’s promoted in the past. Thank you so much for your work and dedication! Great interview, though it’s a little disheartening to see the others moving away from 2D. I guess this sort of thing was bound to happen with it being cheaper and easier to animate in 3D. Thanks, fixed it! It got purged as someone replaced those clips with creditless ones.